Many of us have met people that put off vibes that don’t sit right with us. But sometimes, their later actions make it clear why we found their vibe to be a little “off”. That intuition can often be a clear indicator of what we later validate to be true of the people we interact with. For many, that intuition we feel during a first impression can be a sign that we picked up on that person’s aura. Often unknowingly, we read the auras of others and those perceptions help us to make an opinion about the type of person they are or the way they may feel. Further, the practice of reading auras can assist us in further examining the spiritual health of an individual – just by looking at them. It is thought that all living things that require oxygen to survive have auras. They generate a magnetic energy field that people can see, feel, and sense around the physical body. It’s not uncommon for people to sense when they don’t have a good feeling about someone in their immediate vicinity. For instance, you can tell when someone is full of hatred or anger for you, or if they harbor some ill-will towards you. You don’t need psychic powers to read or feel an aura. An aura is like luminous radiation that looks like a halo and surrounds living beings. It is considered an energy field that emanates from within, reflecting the spiritual conditions of each and every living being. Sometimes, even an inanimate object may have an aura. This may be caused by the reflections of some surrounding electromagnetic fields. 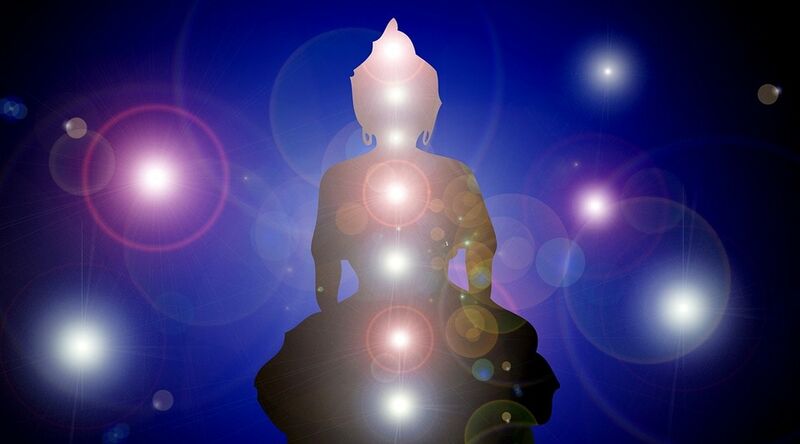 When a person’s chakras are properly aligned, he or she is considered to be balanced across all planes. The colors of their auras will be in perfect harmony and will appear to be like a rainbow. Some people believe that when a person emits a vibrant white or violet light, it’s an indication of a spiritual or harmonious person. Red – This is the base chakra and is related to the root of your very being. Orange – The sacral chakra is related to sexuality. Yellow – This is near the solar plexus and deals with wisdom. Green – The heart chakra is for love and healing. Blue – This is the throat chakra and is associated with communication. Indigo – Called the third eye chakra related to psychic ability. Violet or white – This is the crown chakra and may be seen either as a violet or white color. It is connected to spiritual awareness and is a link to the universe. When all these chakras are properly aligned, it is believed that they transition from a murky color to a perfect bright color. As with most spiritual experiments, it’s important to find a quiet place where there will be no interruptions. Ensure that you have a subject to work with; that person will assist you in this experiment. It’s important that you have a white background or wall that will act a backdrop when you are reading their aura and try to conduct the experiment in the daytime if possible. You and the subject need to slow down your breathing and take some time to meditate. It’s important to get into the right type of mindset required for your experiment. Make the person stand to face you or sideways while you focus your vision a couple of feet above their head; do not stare at any specific part of their body. It’s necessary that you allow your eyes to wander far away from your subject and don’t strain your eyes in any way. You will soon begin to see some movement just behind your subject. Whether you see smoky vapors or a haze or even wavy lines, make note of the strength of the emanations and their different colors. Ascertain which of the color/s are standing out. The other important aspect is that you should align yourself properly with the subject; that is the way in which you create a link required to see the person’s aura. An aura presents itself in a variety of ways; sometimes it may also look like a halo of light. Once you gain mastery over these first few steps of focusing and getting into the groove, you will be able to notice at least a hint of the person’s aura. While you are doing this, take note of the dominant colors. You can use the color guide we mentioned earlier to get a better idea of what that person’s energies indicate- are they more loving, healing, sexual or psychic etc. You can also try another experiment in which you are the subject and you try to read your own aura. Find a mirror where you are able to see your reflection against a white background. Go into the meditative state and focus on slow breathing. Now train your vision on your nose or a few inches above your head. Once you begin to see some energies or auras, make note of what you notice. One of the best aspects of this particular experiment is that you are able to read your own emotions. Since you know what you are feeling, you can cross-reference that with what you are seeing to determine whether these two things are in sync and you are on the right track. Take the experiment a step further by altering your frame of mind and then see whether there is any change in the aura and colors. Aura reading isn’t something you can learn in a day. It can take some time and a significant amount of practice. But if you persist, you will be able to master the art of aura reading. Expanding one’s understanding of auras can also be helped with certain tools that are now available. By using an aura photo camera to see an individual’s aura, you will help reduce reading aura mistakes as you will have a visual representation of what you are trying to see. Learn more about aura cameras and the benefits of aura photography to help understand more about auras.